Fluidigm Corporation, a leader in mass cytometry and microfluidics technologies, today announced the introduction of a REAP-seq (RNA expression and protein sequencing) protocol for use with the C1™ system. 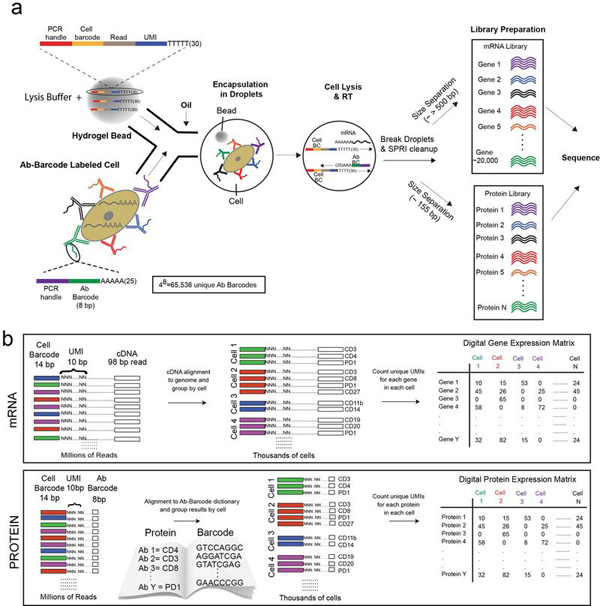 C1 REAP-seq is a powerful multi-omic single-cell application that enables deep characterization of unique cellular subtypes and functional states by measuring the expression of both cellular proteins and RNAs. Capable of pairing with functional imaging assays that measure differences in cell size, morphology or phenotype within the clear C1 microfluidic cell chambers, C1 REAP-seq represents a significant step forward in multi-omic analysis for basic and translational research. (a) Cells are labeled with Ab-Barcodes before compartmentalization into discrete droplets containing a bead with cell-barcode primers. Upon droplet formation the cell is lysed and the polyadenylated mRNA and AbBs hybridize to the poly(dT) cell barcoded primer. REAP-seq leverages the DNA polymerase activity of reverse transcriptase to simultaneously extend the hybridized AbB and synthesize complementary DNA from mRNA in the same reaction. The droplet emulsion is then broken and the cell barcoded AbB sequences (∼155 bp) are size fractionated from the cell barcoded cDNA derived from mRNA (>∼500 bp). mRNA and protein libraries are prepared and sequenced (see Methods). (b) Paired end sequencing reads for mRNA and protein libraries are generated on a high-throughput sequencer. The mRNA workflow is similar to previously published methods. Protein sequencing reads are first aligned using an antibody-barcode dictionary that associates each antibody with a unique 8 bp sequence Next, reads are grouped by their cell barcodes, and sequences with unique UMIs are counted for each protein and gene in each cell. The result is a digital protein and gene expression matrix where each column corresponds to a cell, and each row corresponds to a different protein or gene. Each entry in this matrix is the integer number of detected genes or proteins per cell.